Jan 26, 2019: The Volvo FM 480 is a good truck with a decent payload capacity of 38,810 kilograms. The GVW of the vehicle is 59,000 kilograms. The wheelbase of the truck is 6,670 mm, and the ground clearance is 390 mm. It has a Rock/Scoop body with a day cabin where AC, a driver information display, adjustable driver seat, and power steering with tiltable column are the standard features. The air brakes with ABS provides excellent stopping power. Also, the parking brakes make enhances the convenience of the driver. A front there is leaf springs suspension, and the Multi-leaf springs suspension is provided at the rear. Under the hood, there is a 12.8-litre Volvo D13A, DI heavy duty turbocharged inter-cooled engine which can make up to 480 bhp power and the peak torque is 2,400 Nm. 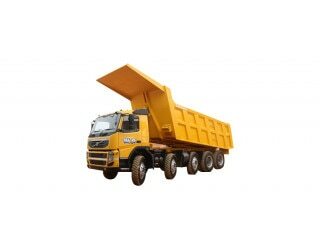 It's the best truck for transportation purpose which is seen by me when I was a supervisor at the construction site it's really comfortable and easy to handle it's gaint like structure made it unique from other trucks and it's really out standing truck ever which cannot be compared to other trucks. Another remarkable vehicle by Swedish truck manufacturer Volvo, FM 480 8X4 tippers come with unmatched features specifically designed to carry heavy load in difficult-to-navigate terrain. Based on state of the art new generation global FM platform, Volvo FM 480 tippers promise high payload capacity and unbeatable performance, making the vehicle an ideal choice for all kinds of off road and on road operations. Volvo FM 480 boasts of a powerful engine backed by a reliable driveline, strong chassis, and body frame. Also, bigger tyres, high ground clearance and driver-friendly cabin make the tipper a must-have for moving goods on harsh road conditions. The vehicle is ideal for transporting coal, iron and other mineral ores, limestone, marble, or demanding applications such as irrigation work or aggregates. A comprehensive nationwide network of service and spare parts centers ensures assistance whenever required. The Volvo D13A, DI Heavy Duty Turbocharged Intercooled engine comes with Engine Management System (EMS) for precise and efficient engine control. Volvo FM 480 has a displacement of 12800 cc and a max power of 480bhp @ 1400-1800rpm, thus generating a max torque of 2400Nm @ 1050-1400rpm. The fuel efficient new generation 6 cylinder inline diesel engine meets Euro-III standards. Turbocharger and intercooler provide increased power with less fuel consumption at reduced emission levels. A good gradeability of 30% provide optimum support to the truck while climbing steep gradients. A max speed of 50 km/hr and a 270 litres fuel tank help the vehicle cover long and remote distances with ease without refueling hassles. A decent payload capacity of 38810 kgs is supported by a Gross Vehicle Weight of 59000 kgs. Fitted with 12x24 off-highway pattern large-sized tyres, Volvo FM 480 tipper displays high performance and stability while cruising through tough off-road conditions, such as mines, and also provides increased ground clearance. A heavy-duty sump guard covers the complete sump and protects the underbody of the vehicle. Superior features provide support to the driver while handling the vehicle in difficult road conditions. Volvo FM 480 is equipped with air suspension at the front and Multi leaf springs suspension at the back that reduce stress on the chassis frame and enable better riding comfort at high average speeds. Larger wheel angles offer a lower turning radius of 13500 mm and a short wheelbase of 6670 mm provide excellent maneuverability during onsite operations and on narrow roads. Since 1969, Volvo trucks have been documenting and analyzing more than 1,400 accidents involving Volvo Trucks through its accident research commission. The company’s dedication to designing safer vehicles is evident in the Volvo FM series, making the vehicles one of the safest in the world. Crash tested safety cabin has a cab frame made of high tensile. Seats have been designed with integrated head restraints and incorporated with 3 point inertia seat belts for driver and attendant. Other safety features include an energy absorbing safety steering wheel, fire-resistant fabrics, and ergonomically designed minimize the risk of injury to feet and legs. Efficient and effective air brakes have fully floating type brake shoes and evenly distribute the braking force, offering better vehicle control. Designed for extensive operations and safety, the air conditioned cabin is equipped with effective in-cab climate. The noise insulated cabin comes with adjustable cushioned driver seat and is fully suspended by four coil springs and shock absorbers for minimal vibrations. Power steering and adjustable driver seat ensure optimum driver comfort. Anatomically designed seats, low noise level, high capacity climate control system and a world class safety level make Volvo a class amongst others.